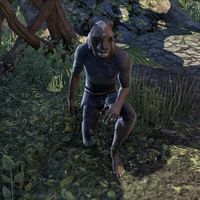 Adibazal is a Khajiit patron of the Outside Inn in the city of Elden Root. If spoken to, he'll say, "Hey, walker. You give this one directions to Redfur, yes? ", or, "Help a walker out. This one had ... has needs, this one does. This one needs to hire a caravan, yes? You buy this mammoth cheese?" This page was last modified on 17 January 2018, at 13:55.